Nick Bommarito, Owner and Senior Winemaker and his daughter Cathleen Bommarito Manley have been partners in wine making since 1995 when they began planting Norton grapes in the land behind their family home. They continued to acquire adjacent property (most recently at 11 acres) and their plantings now include North, Vignole, Chambourcin, and St. Vincent, and the Vidal Blanc vines which were added in 2009. The wines they produce reflect the influences of the soil, climate, and of course the grapes themselves. You will enjoy meeting members of their family as you visit the Bommarito Estate Almond Tree Winery tasting room, which is open year-round on Saturdays & Sundays. In the winter months you will find a roaring fire in the fireplace, keeping their tasting room warm and cozy and can accommodate up to 24 guests. Each year they work to present a new wine item, so be sure to inquire on your visit. On rare occasions, Lemoncello (winemaker Cathy’s specialty) will be brought out for a tasting; her recipe comes from Sicily, and has been modified with Cathy’s own special touch. 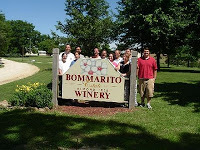 Visit the Bommarito Estate Almond Tree Winery website for details on hours and special events. They are located 10 miles east of Hermann Hill Bed & Breakfast Vineyard Inn; we hope you will plan to stay with us as you tour the great Missouri Wineries!